Apparently it’s only a matter of time before the god of war, Ares, returns and will have to be fought. 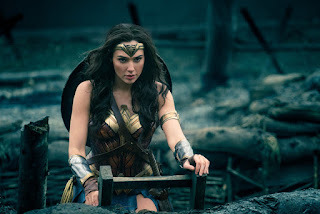 Princess Diana (played by Gal Gadot) grows up on the all-female Amazon island of Themyscira, hidden under a permanent cloud. She trains up as a fearsome warrior. When a fighter pilot ditches in the sea, World War One invades their idyllic locale and their use of the bow is challenged by the bullet. 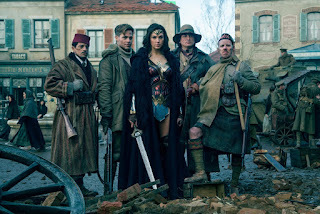 Diana sails away with Steve Trevor (Chris Pine), an American spy working for British Intelligence to find Ares and stop the war. Definitional battles litter the dialogue. A motley crew assembled to raid enemy territory add a comedy element to the chemical warfare jeopardy even though it’s impossible not to believe that they have fallen through a worm hole from the Trainspotting universe. Lucy Davis is delightful as secretary Etta Candy. Iron Sky brought Nazis from the dark side of the moon to the silver screen. But Wonder Woman’s projection of the battle between Zeus and Ares onto World War One verges on being tasteless and nearly demeans the wartime struggle with its supernatural intervention. The final chapters of the film neatly weave together three parallel battles. Love and righteous anger threaten to vanquish hatred. The corruption of the human race may yet frustrate Diane Prince’s best efforts. But by now, the manner in which the film concludes is less important than the fact that the credits roll and you can escape the DC Extended Universe. Wonder Woman continues to play in most cinemas across Northern Ireland.